Globular vase, with short neck and instable base. On the upper part, stylized floral motives go around the piece. Underneath, there is an original decoration, showing the Meroitic pottery as an independent production, with its own style, although not completely disregarding Egyptian traditions. A man, standing up, depicted at the same time in frontal and profile position, is carrying a jar in his hand. 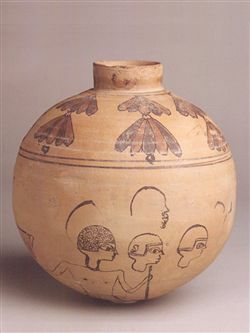 Three other heads, in profile, are also drawn on this beautiful vase, found by Spanish archaeologists in Nubia. ALMAGRO BASCH, M., La Necrópolis Meroítica de Nag Gamus (Masmas, Nubia Egipcia). Memorias de la Misión Arqueológica Española en Nubia, VIII, 1965, P. 56 Fig. 41 Lám. XXVIII. ALMAGRO BASCH, M.; ALMAGRO GORBEA, Mª J.; PEREZ - DIE, Mª C., Arte faraónico. Exposición, 1975, P. 200 Nº. 199. PEREZ-DIE, Mª C., Egipto y Próximo Oriente. Guía General del Museo Arqueológico Nacional, 1996, P. 111. PEREZ-DIE, Mª C., Egipto. Guía Didáctica del Museo Arqueológico Nacional, 1985, P. 60. ALMAGRO BASCH, M; RIPOLL, E; MONREAL, L. Las Necrópolis de Masmás, Alto Egipto (campaña de 1963), Memorias de la Misión Arqueológica Española en Nubia, III, 1964, P. 47 Fig. 36 Lám. XIV.